High Fiber/High Energy complete feed to promote bulk and finish. Advanced protein and amino acid nutrition: Unlocks the calf’s potential for muscle growth and development with select sources of non-degradable and rumen degradable proteins to promote rumen microbial growth and furnish the best complement of essential amino acids. Optimal energy nutrition: Matches the calf’s growing energy needs with multiple sources of energy during the growing phase and as weight gains shift from growth to finishing. Supports efficient growth and development with reduced risk of digestive upsets (off-feed problems, acidosis, burnout) sometimes seen when excessive cereal grains are fed. Optimal trace minerals: Proteinated copper, zinc, manganese and cobalt are used to provide highly bioavailable sources of these key trace minerals for protein synthesis and energy utilization and to help maintain tissue integrity, support the immune system response and help maintain show condition of hair coat and hide. Rumen and Gut Health Technology: Helps improve feed intake and helps reduce risk of digestive upsets and burnout over long feeding periods. At the start of the feeding period, fill calves on hay and gradually introduce Sunglo® Show Calf Developer over time the first day, divided into two equal feedings. Increase feed by 1-1.5 lbs. per day, with corresponding decreases in hay until full feed intake is achieved. 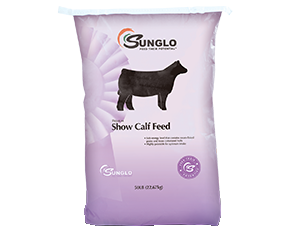 Once calves are on full feed, Sunglo® Show Calf Grower should be hand fed in equal feedings twice a day. Transition slowly from one ration to another to minimize risk of digestive upsets. Feed should be completely consumed before next feeding. Do not allow feed to build up in bunk and get moldy. Remove any feed not consumed during the feeding period and reduce the amount of feed in proportion to the amount left over. Similarly, increase the amount of feed when feed is completely consumed before the next feeding, but limit this increase to one pound or less per feeding. Feed according to the feeding schedule below as a general guideline. Daily feed should be divided into two or more equal feedings, and the time of feeding should be consistent from day to day. Add Sunglo® Full Tank™ and feed at a rate of 1-5 lbs. per head per day to meet desired weight gain. Some large-frame calves may require longer finishing periods or increased energy density in the finishing ration to achieve the desired finish. To increase energy density, 50/50 Sunglo® Show Calf Developer and Sunglo® Show Calf Finisher. Add 1-3 lbs. of Sunglo® LiquaFAT™ or Show Edge® Power PHAT™ to meet desired finish. This feed has been carefully formulated to promote consumption. However, should your calf experience a drop in feed consumption of more than 10% of targeted daily feed intake for more than two days, blend in Sunglo® 2 the Fullest™ at a rate up to 1/2 of daily intake to enhance appetite. A more dramatic drop in feed consumption may require going back to the beginning and reinitiating your calf to feed. In either case, return to Sunglo® Show Calf Developer ration should be done gradually. Should your calf go completely off feed, consult your veterinarian or Sunglo® Show Feed specialist.